Firstly, if you borrow money, there's a 'rate of interest' you have to pay. It refers to the fact that you have to pay back the loan and the charge for borrowing it. Think of interest as a kind of 'fee' for the lender agreeing to let you have the money in your bank account, rather than theirs. So how does it work? Well, if you borrow money and the interest rate is 65% a year, then it will cost you 65% of the amount you borrow. So, for example, if you borrowed £100 from a lender at a 65% rate of interest a year, you would need to pay £65 on top of the loan, a total of £165. Bear in mind that some loans are calculated using monthly interest instead. So, make sure you check how your interest is calculated, as this will help you to figure out whether or not you can afford the loan at the rate of interest you've been quoted. When you borrow money for a car loan, you'll also be quoted something called APR. APR stands for Annual Percentage Rate, and it's the number that covers the total cost of borrowing money, including the associated fees and interest rates. APR rates vary from lender to lender. What is a flat rate of interest? A flat rate of interest is an amount of interest you pay on the original amount. If your loan is quoted with a flat rate of interest, you'll need to pay the flat rate of interest as well as the APR. So what do I have to calculate in total? If you borrow £1,000 against your car over 36 weeks at a flat rate of 96% interest per annum (fixed), with a representative rate of APR of 230.70%, you'd need to work out what the flat rate of interest would cost you, and the APR too. Once you've done those calculations - making 156 weekly payments at £24.87 a week, for example - you'd pay back the loan and less than £3,000 in charges for taking out credit. This is useful for people with bad credit ratings, as while there's a charge for taking out credit in the first place, it enables people to get access to a loan who would usually be excluded, paying it off over as many months as they need to, or earlier if their circumstances unexpectedly improve. Some loans are pay as you go (such as the kind of loan we offer at Car Cash Point) which is good as you'll only pay interest all the while you still owe money, and there's no early settlement fee either - so if you come into a lump sum of money mid-way through the loan, you can pay everything back without being 'punished' for doing so. Where should you get a loan? If you search for a loan on Google, you'll to find quick loans at low interest, high interest and everywhere in between. If you need to borrow money against your car, make sure that you're happy with the deal and service the lender can offer you. Never take out a loan from a company that won't disclose their maximum APR. 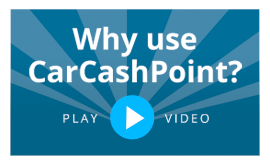 At Car Cash Point, we disclose our maximum APR, and have a team of people that can turn your application around in an hour that are on hand and ready to give you all the necessary information, helping you to make a decision that's right for you.